I realize this is a bit late but I’m out of town and have limited internet access. So there you have it. Good thing this is so darn easy, you could make it in an hour and have a little gift for your sweetheart in no time flat. 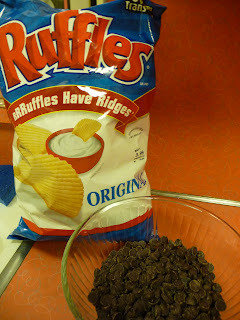 All you need is some Ruffles and a bag of chocolate chips. 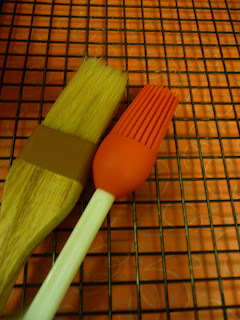 And a brush of some sort, and a rack or cookie sheet. 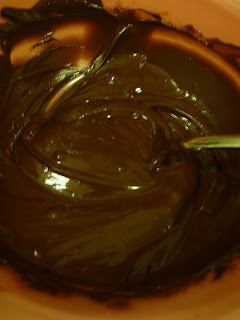 Melt the chocolate in a double boiler or in the microwave. Stir it through so that there are so lumps. 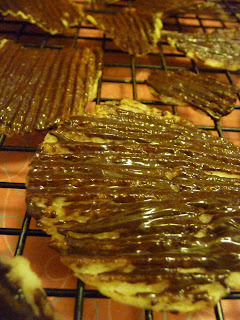 Lightly brush each chip with some chocolate—Just on one side! 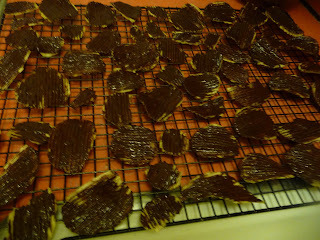 And just let them dry. I packaged them in Chinese food boxes that we got at Smart and Final. They are very addicting so this size box is good because otherwise you’d probably make yourself sick by eating too many. Happy Valentines Day to you and all your sweeties out there—and to all my sweeties too.